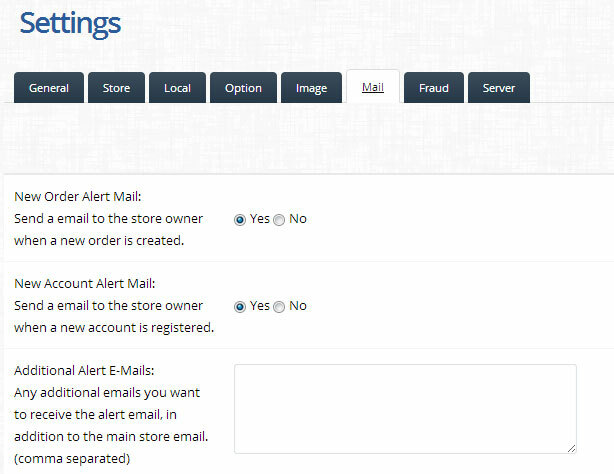 The settings sections is comprised from the following tabs: General, Store, Local, Option, Image, Mail and Server. Telephone: insert your personal or office phone number. 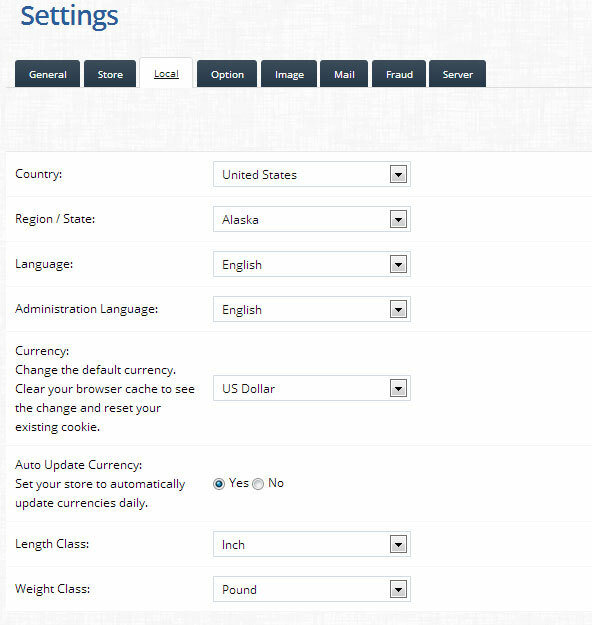 The Local section includes the following: Country, Region / State, Language, Administration Language, Currency, and Auto Update Currency ( set your store to automatically update currencies daily, Yes or No), Length Class & Weight Class. Minimum amount a customer can purchase a voucher for. Maximum amount a customer can purchase a voucher for. Use the store address to calculate taxes if no one is logged in. You can choose to use the store address for the customers shipping or payment address. Use the customers default address when they login to calculate taxes. 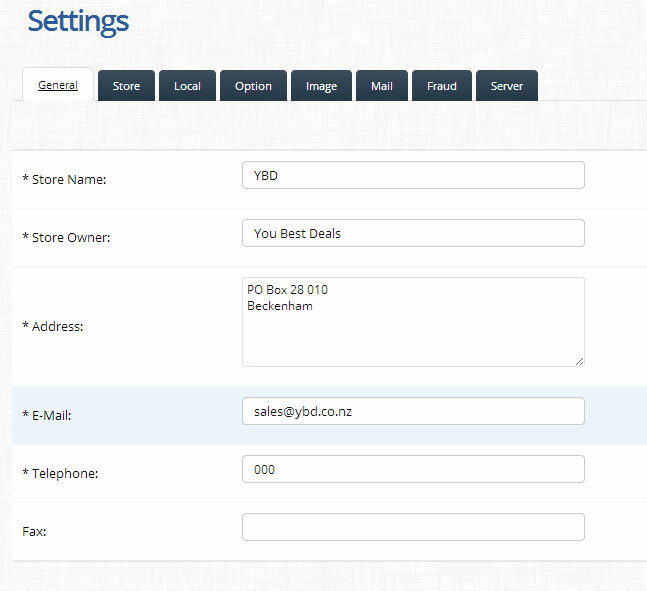 You can choose to use the default address for the customers shipping or payment address. 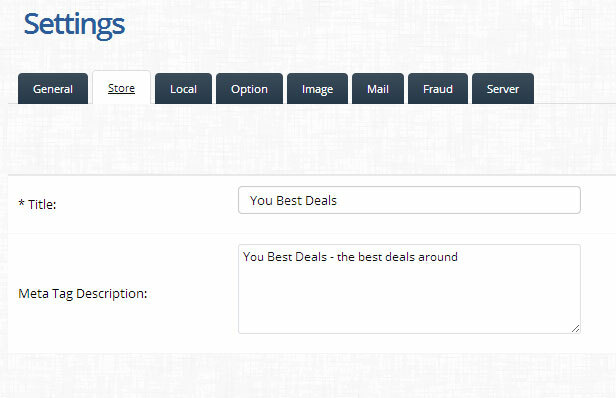 Display customer groups that new customers can select to use such as wholesale and business when signing up. Forces people to agree to terms before an account can be created. Forces people to agree to terms before an a customer can checkout. Number of days allowed to edit an order. This is required because prices and discounts may change over time corrupting the order if it’s edited. Set the default order status when an order is processed. Set the order status the customers order must reach before they are allowed to access their downloadable products and gift vouchers. Set the default out of stock status selected in product edit. Forces people to agree to terms before an affiliate account can be created. The default affiliate commission percentage. Forces people to agree to terms before an return account can be created. Set the default return status when an returns request is submitted. 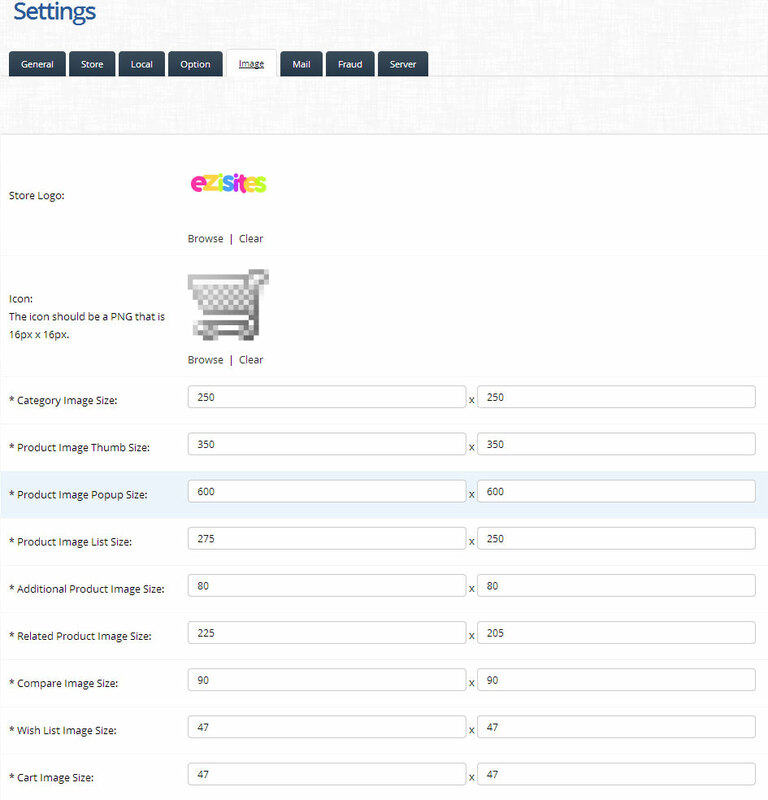 Store Logo Icon, Product Image Thumbs Size, Product Image Popup Size, Category List Size, Product List Size, Additional Product Image Size, Related Product Image Size and Cart Image Size. A Favicon icon to display in the browser window next to the store address. Should be a PNG that is 16px x 16px. 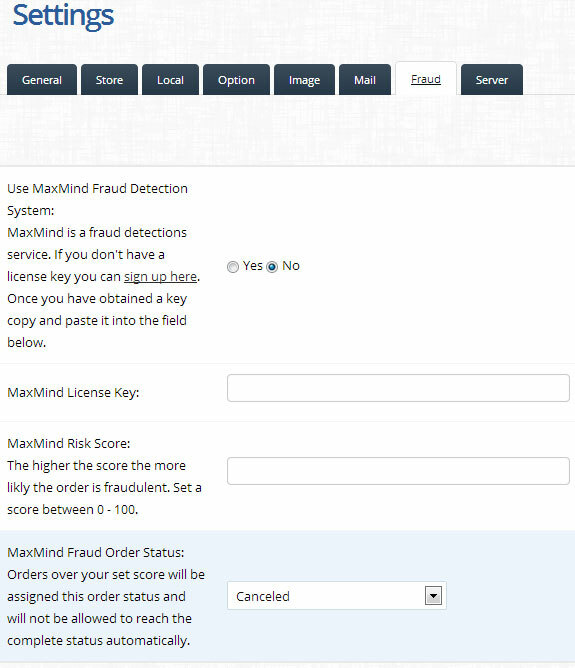 MaxMind is a fraud detections service. If you don’t have a license key you can sign up. Once you have obtained a key copy and paste it into the field below. Google Analytics is a statistics tool that displays how many visitors the website has (on different timeframes), where they come from, how they’ve reached your website and other information. 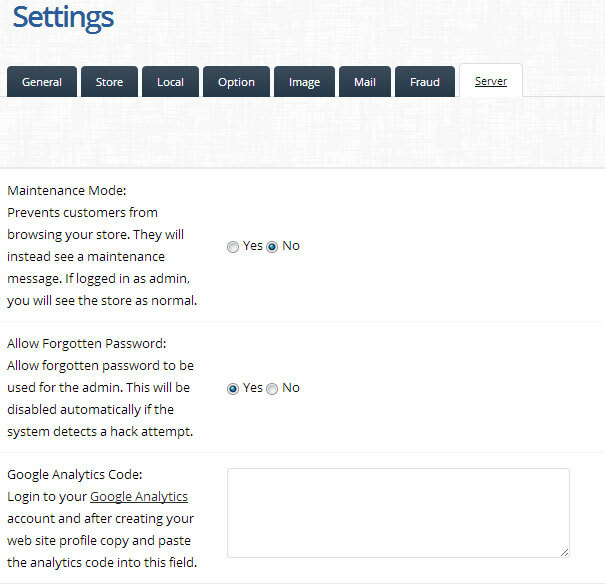 Log in to your Google Analytics / or set up a new account and after creating your web site profile copy and paste the analytics code into this field.